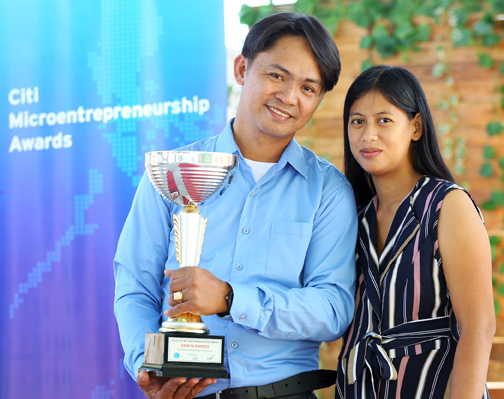 Erwin Ramos, a fishball maker from Bulacan and the national winner of the 16th Citi Microentrepreneurship Award, never misses a chance to inspire others by telling regaling stories of how he and his wife, Lanie, were able to turn their simple fishball-making business into a success. Fishball maker and 16th CMA Microentrepreneur of the Year Erwin Ramos and wife Lanie show the award during a celebratory townhall in their hometown of Paombong, Bulacan in front of family, friends and fellow microentrepreneurs. In a celebration organized by Citi Foundation and the Microfinance Council of the Philippines in his hometown of Paombong, Bulacan, Ramos once again looked back into his bittersweet journey, with his family, friends and fellow microentrepreneurs in attendance. Ramos started with his fishball making business using the fishball recipe he inherited from his father-in-law. He experimented with bidbid, a fish considered a pest by bangus growers and marketed his product not only in his hometown but also in neighboring areas like Calumpit, Malolos, Hagonoy, Santa Rosa, Santa Maria, Pampanga and Metro Manila. By offering samples and using his wit and good social skills, he was able to make his fishball known. Ramos now produces more than 2,000 kilos of fishballs every day. He has also gone into the production of daing (dried fish) and Paombong vinegar. He received financial support for his business from his microfinance institution partner Uplift Philippines Inc. From an initial loan of P5,000, Ramos is now on his 11th loan cycle with a loan amount of P200,000 which was used to buy production machinery and a van. Made possible through the combined efforts of the Bangko Sentral ng Pilipinas, Citi Philippines and the MCPI, the CMA provides entrepreneurs with resources to strengthen their business and enables individuals to create economic sustainability for themselves, their families and their communities.